Gillie & Marc Schattner, flying fish, Sculpture by the Sea, Bondi 2015. Photo Jessica Wyld. Monday November 9 marked the end of Sculpture by the Sea, Bondi 2015. With the kind cooperation and understanding of Waverley Council, we were able to extend the exhibition by an extra day to make up for some wet weather along the way. 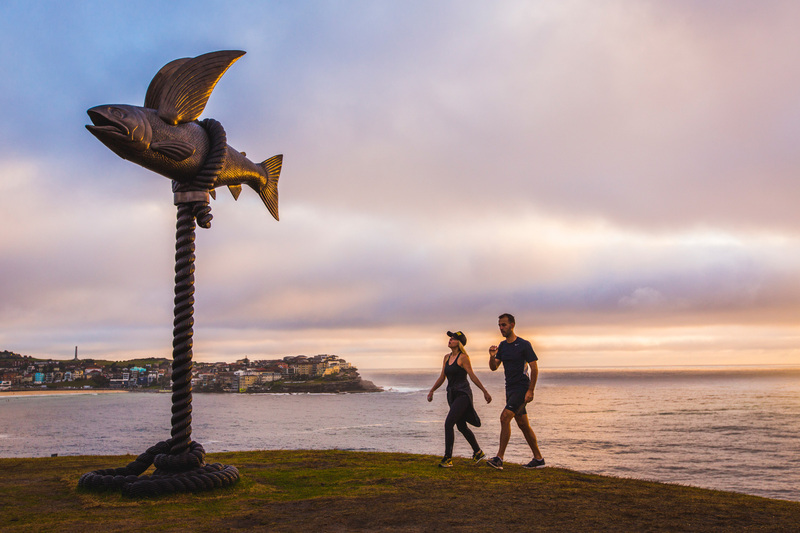 With over 106 sculptures on offer representing artists from all around Australia and the globe, hoards of people flocked to the Bondi to Tamarama coastal walk for the 19th annual Sculpture by the Sea, Bondi exhibition. Over the two and a half week course of the exhibition, hundreds of thousands of local, national and international visitors soaked up the sunshine, battled through the rain and took in the awe of some of the world’s finest sculptures. Through our Schools Education Program, thousands participated in Artist led Workshops, Focus Tours and Tactile Tours. Our weekend Macquarie Artist Talks also gave visitors the rare opportunity to learn more about the Artists’ background, intentions and sculpting techniques. A massive thank you to our 200 volunteers who generously donated over 3500 hours of their time throughout the event. Without their incredible support, the exhibition could not happen. Thank you also to the people of Sydney and all spectators and visitors who kindly made gold coin donations. Every bit of support helps stage this annual event, ensuring that admission is free. Sculpture by the Sea would like to thank all those who have lovingly donated or volunteered throughout the exhibition. In addition to the Allen’s People’s Choice Prize announcement that was made at the awards ceremony held on Sunday 8 November, a number of other sculptures received recognition. RCM Collective received the Kids Choice Prize, donated by Rebel Penfold-Russell, for their fun and interactive artwork The Bottles. Gillie and Marc Schattner were awarded the Waverley Council Parks Staff Prize by Mayor Sally Betts for their iconic Flying Fish and Barbara Licha took out the Sculpture by the Sea Staff Pick for her thought-provoking piece Listen, Time Passes. Find out about other awards and subsidies here. Finally, but most importantly, thank you to the wonderful exhibiting artists, without whom the exhibition would not exist. Your creativity, dedication and hard work is an inspiration to us all!